There is no doubt that choosing a perfect bridal dress is the most important first for brides, but choosing a perfect bridal dress is just a beginning to design a great wedding day. However , the wedding accessories for brides is absolutely necessary, such as hairstyles, make-up, brides head wears, and the decoration for the wedding day, all of which are the key to create a perfect wedding day. Wedding veils are the common wedding accessories on wedding day, which can add the mysteries and pretty for brides. 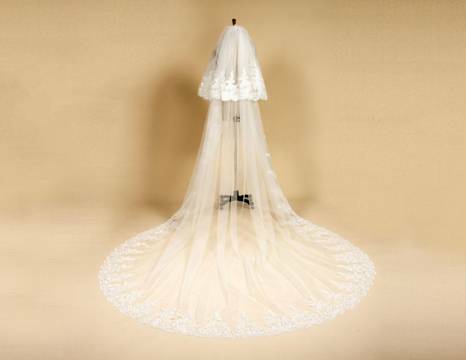 We are a top quality bridal dress manufacturer and supplier in china, so supplying a complete wedding accessories is our mission, such as wedding veils, sash, handbags ,all of them are the key to make a bride more perfect. You can also choose lace bolero and chiffon cape to decorate yourself. In addition, water-drop earring and shinny necklace and bracelet are good choice for brides to decorate their self. Last but the most, brides shoes is highlight for wedding day. A pair of brides shoes like pink or blue are good choice for wedding.